(1) This mobile concrete block machine using the manual force control and jog control together, the operation is simple and efficient. (2)QYJ4-45 mobile concrete block machine is a multi-useful block machine, which could produce road blocks, curb stones, concrete blocks, hollow blocks and other shapes of different specifications of concrete products though changing the block mould. (3)SINOSUN mobile concrete block making machine QYJ4-45 using imported electrical appliances, sealing parts, the equipment's comprehensive performance is stable and reliable. (4) The concrete blocks which produced by QYJ4-45 mobile concrete block machine are all of high strength, good density, good appearance, accurate size and regular shapes. 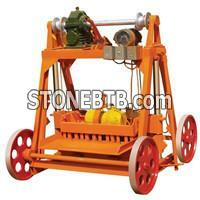 <a href="small">http://www.sino-blockmachine.com/Small-and-Mobile-Block-Making-Machine/">small and mobile block making machine</a>.